Truly a magnificent film. Thanks, Sanket. PPCC khush hui. oh i am so so worried about the 2nd Mr India! I do hope it works out- love love love Sridevi! Well that settles it--Mr. India goes onto the evergrowing list! Been looking for a good Sridevi film to watch--good to see you back, Sanket! 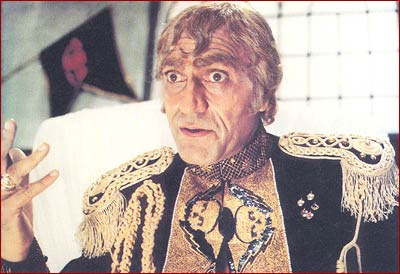 PPCC - And somewhere out there, Amrish Puri bhi khush hoyenge. JJC - They were a great duo and Sridevi is one of those actresses (like Rekha) that just grew more beautiful and graceful the older she got. It must be something in the water down southside! Shweta - I worry whenever they try and make an 'Any movie 2' but as long as they try and go with the feel of the original with the same stars (Munna Bhai comes to mind) I am hopeful that it will work out. I don't see Sridevi sitting idly by without some sort of input into her comeback film. Great film, have nothing but extremely fond memories! 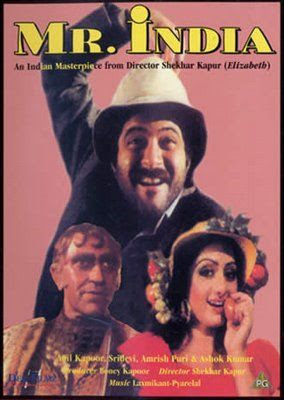 As someone who first saw this as a five year old and loved it, and as someone who thinks Amrish Puri as Mogambo is likely the best villain in the history of all cinema (at least alongside Gabbar from Sholay and Captain Russell from Lagaan), I worry at the mere mention of a remake. On the flip side, having Anil and Sridevi in any film would certainly make me look forward to it! It's a real coincidence that you wrote about it the week this happened! I guess that means Doc Bollywood has a challenge! I will work on it and get back to you with a complete list next time I get with our Bollywood-fanatic friends. can u tell me the titles and movies of the real song in the parody song?? lovely review...I love this film to bits and it was one of my favourite movies of the 80s.. Notwithstanding, please lets get our FACTS right in order not to misinform people...HUKUMAT starring Dharmendra and Rati Agnirothihi was the Biggest Money spinner of 1987 with Mr India coming a close second..